All transactions are safe and secure with a reliable history in online purchasing behind each of our associates. 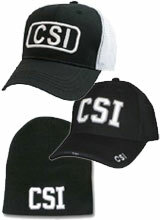 Buy the CSI Hats to own CSI clothing and merchandise. These Crime Scene Investigation hats are perfect for costumes or just to let everyone know that you're ready to work the case, whether it be a dead bug or a missing stuffed animal. Choose from a variety of options, including the laid back trucker hat or the CSI beanie that is ideal for working outdoor crime scenes in the winter. The caps will keep the sun out of your eyes as you're collecting evidence or dusting for fingerprints. In addition to the CSI Hats above, browse the CSI Clothing Gallery for more apparel like men's and women's clothes, kids shirts or hoodies.